Wednesday 4th – Monday 9th July 2018. Despite the best efforts of the Italian Railways to recreate a little slice of British Rail abroad (delays, cancellations and general disruption) I made my way from Milan Malpensa Airport to Göschenen via the newly opened border crossing at Stabio. My arrival was an hour later than planned, but with the stunning local scenery and the prospect of four excellent days of visits and travelling ahead, I wasn’t really that bothered with the delays. I had arranged for our group to stay for three nights in Göschenen, and then for a further two nights in Bellinzona. The proprietors of the Hotel Chalet Krone were to be excellent hosts, who couldn’t do enough for our group. We were situated only three minutes from the railway station, so could not have been better located either. 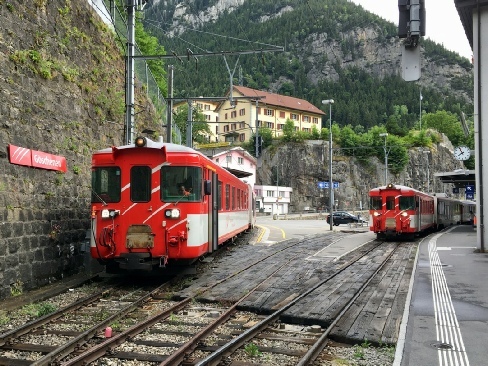 Sadly though, the rail line through the region is now a shadow of its former self, with virtually all freight traffic and most of the long distance passenger trains now running via the 57km Gotthard Basis Tunnel. A simple hourly local service is all that remains, although we did witness a couple of test trains, a fire rescue train and one ‘restricted’ freight trains, that presumably couldn’t use the new tunnel. The next morning we gathered for breakfast and exchanged further stories around the table. For our first official visit, we were heading for the SBB Works at Bellinzona. Our train, the 08:02 departure, was surprisingly formed of one of the older style Class 560 EMU’s, which have virtually all been replaced by the newer Stadler Rail ‘Flirt’ units. 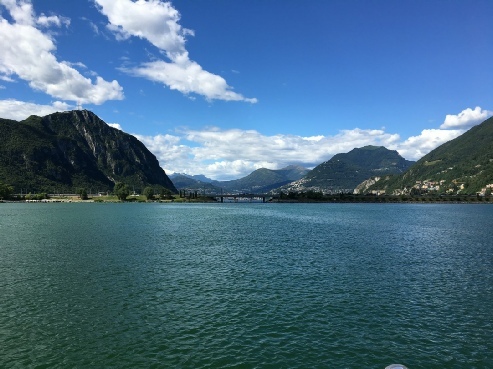 Our arrival into Bellinzona coincided with the departure of the northbound ‘Gotthard Panoramic Express’ which runs from Lugano to Flüelen, and connects with one of the paddle steamers which continue across Lake Luzern. 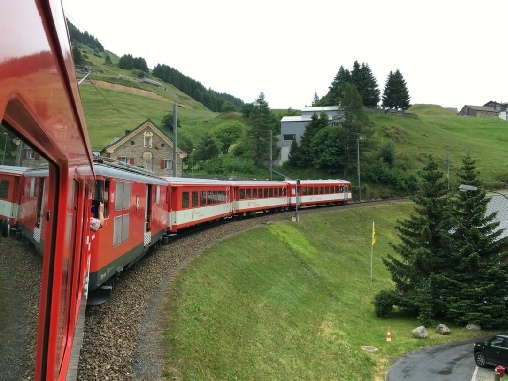 This train, hauled by Re4/4 11192, consists of mainly panoramic style coaches affording better views whilst travelling over the Gotthard Pass. Now joined by two other members, we took the short five-minute walk to the works entrance, where we met our host, Mr Marco Scotti (Kaizen Coach). His job description is a basic translation from the Japanese wording of ‘improvement’, and his daily role is to look at ways for SBB to better itself and to improve its working practices etc,. After introductions (in perfect English on his behalf), we were shown around the outer buildings of the complex, where many ‘specialist’ jobs are undertaken. Here we saw Re6/6 620013 and Re4/4 420247 undergoing bodyside repairs. The works currently employs around 330 staff, but has been reduced significantly in recent years. 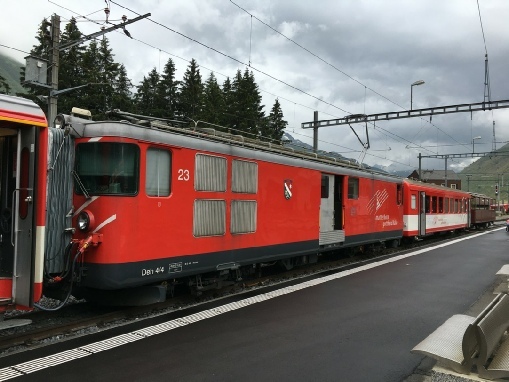 Like many countries, Switzerland is starting to transform some traditional loco-hauled services, into multiple unit type local trains, and high-speed tilting trains for long distance and International traffic. This has directly affected the workload at the depot, and even though freight trains run at increased levels, these are often now in the hands of modern locos, which replace two or three older ones. 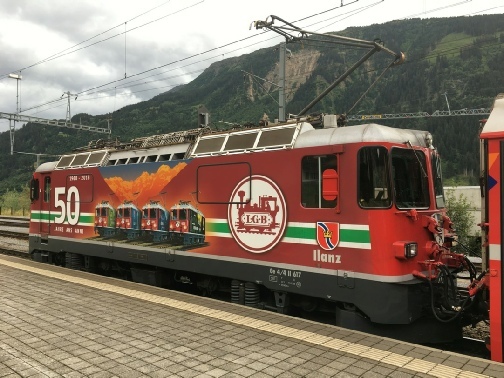 The Zurich area has seen considerable changes to its rail services in recent years, and a major refurbishment programme has taken place for certain locomotive-hauled services. 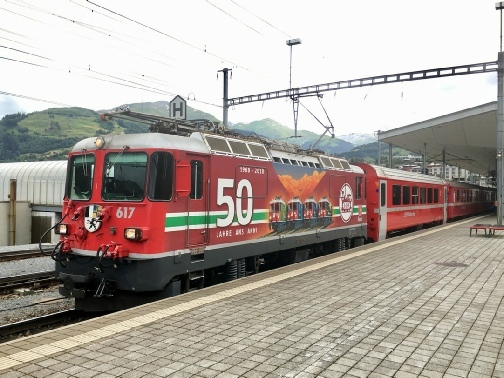 Known as “Lion”, this has seen Bellinzona Works overhaul thirty Re420 locomotives to work in top and tail formation with double deck carriages during the peak hours. With this work virtually completed, staff are now involved with “Refit Re620” which involves life extension work for the freight/cargo locomotives. Each locomotive is stopped for around sixty days, and receives a total strip down and internal rebuild. All electrical components are renewed, and a new livery of ‘all-over’ red is applied. The current CARGO branding is being removed too. Around a dozen locos were being worked upon during our visit, and we were able to see the various stages of overhaul on differing locomotives. Sadly not all locomotives are being treated to this, and several have already been scrapped or withdrawn, in favour of more modern designs, such as the Traxx, 482 or 484. Ten Re6/6 and Re4/4 have already been scrapped, with 11603, 11604, 11308 and 421396 all dumped on site awaiting their fate. Having been escorted and guided around the entire length of the works, (including viewing the three separate traverser’s they use), it was time to conclude our time with SBB, but not before being shown a piece of equipment, a threading machine dating from 1886, which is still used by maintenance staff today! We headed back to the station, where I had allowed sufficient time for coffee, before our next train was due. 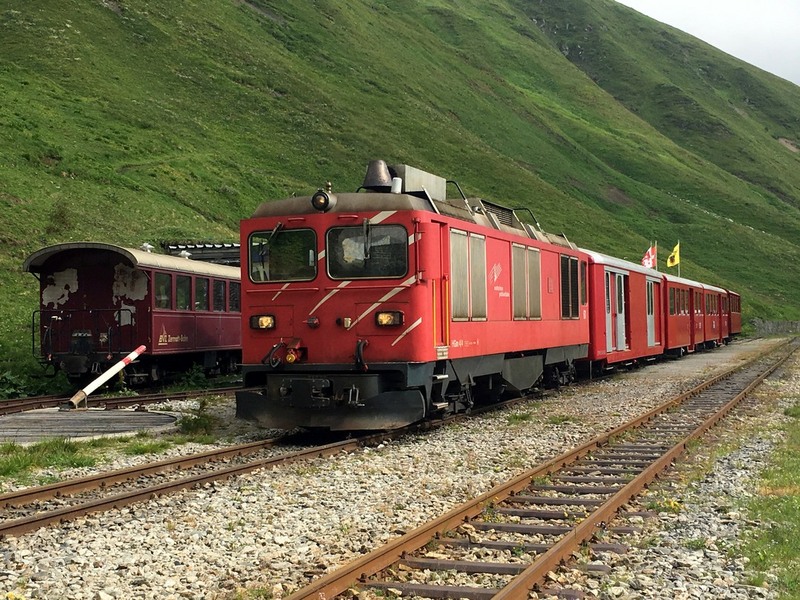 Disentis/Muster was our afternoon destination, by way of changing trains at both Göschenen and Andermatt. The route from Andermatt is quite steep and rack-assisted for most of the way. 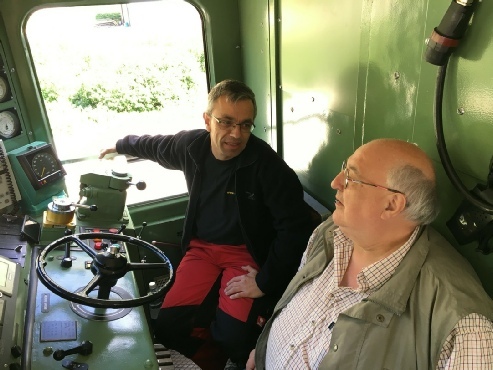 Our motor luggage van was marshalled towards the rear of the train, and controlled from the front by a driving passenger vehicle. At the rear of the train was an ordinary passenger coach and also an open-sided vehicle. 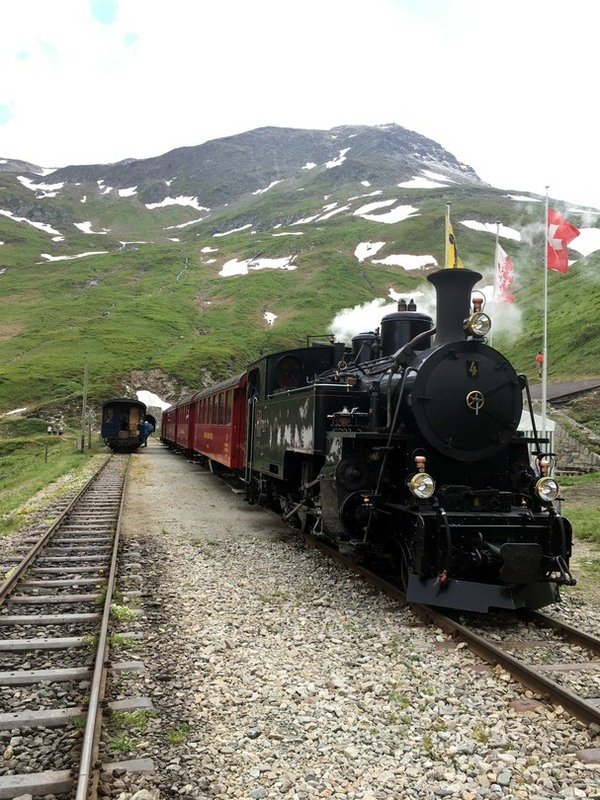 I had never travelled over the route this side of Disentis/Muster, yet knew of the spectacular scenery. It didn’t disappoint, even with the slightly overcast conditions! 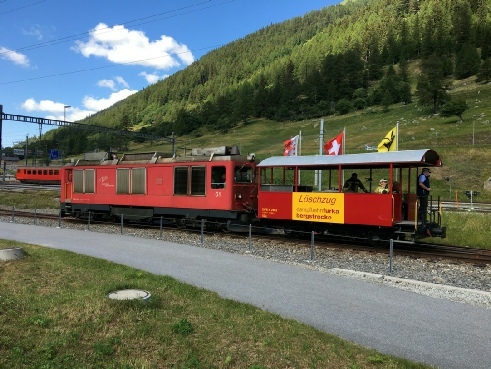 Our afternoon excursion to Disentis/Muster featured a train powered by a motor-baggage car (number 23) sandwiched between regular coaching stock, with an open sided wagon at the very rear. 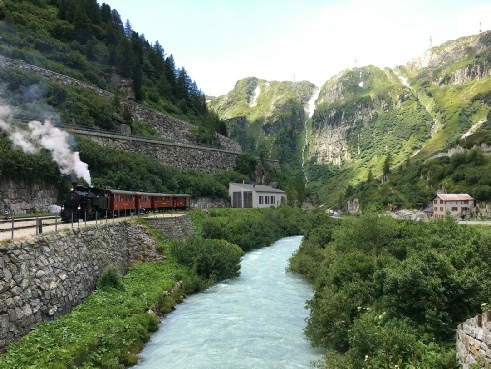 After an excellent visit here, and although still very hot, we opted for a slight detour on our homeward journey to take a ride on a special train operated by the Bern-Lötschbergbahn (BLS) heading from Brig to Burgdorf. We retraced our steps as far as Bern, where we waited for its arrival. Before too long, the recognisable shape of an Ae4/4 came into view. Dating from 1944, the loco (SLM built, no.251), still looked immaculate today, and easily hauled its train (an additional service, yet open to normal ticket holders), on the route north from the capital. Many rail fans had come to the local stations to see it pass through. Even on a late Sunday afternoon, in the fairly short journey to Burgdorf, we passed four freight trains carrying road trailers (HUPAC). I commented that in our 30-minute journey, I had probably seen more freight trains on a Sunday afternoon here, than I might see in a whole week back home in Devon and Cornwall. We said our goodbyes to the special at Burgdorf, and waited for a regular SBB service to Zurich. Upon our arrival into the main station, it was quickly noticed that our intended train back to Bellinzona was showing as ‘cancelled or delayed’. Fortunately we had time to rush across to catch the preceding train, (which was actually the stock to form the later train). It would seem that the inbound train from Milan was heavily delayed, and so, very sensibly, they were using the stock for the later train to depart on-time. It was assumed that the late arrival would, eventually, form our intended service back south – however, we opted not to find out! So, back in Bellinzona, we had our final evening. Unfortunately, the Italian part of Switzerland appears to close early on a Sunday, so we had to make do with a local pizza restaurant for our final meal of the trip. Although very acceptable it was indeed. The following morning, we were all heading separate ways. I was flying home from Milan Linate Airport, so opted to travel via the branch line that runs from Como Nord Lago (at the foot of Lake Como). The weather was now even hotter in Northern Italy – 35’c at 10am. My sincere thanks to all the venues we visited, and to all our hosts whilst in Switzerland, and especially to the members who participated in making this an enjoyable trip. My original plan was to have an evening meal here, whilst overlooking the joint RhB/MGB station. Unfortunately, the lack of late evening return trains required us to leave by 18:14 at the latest, so we opted to have dinner back at our hotel. Our hosts provided another excellent evening meal; with Bratwurst, Rösti and Schnitzel all on offer. Homegrown pumpkin (grown locally by the Mother of the proprietor) also featured as an appetizer. Next morning, the 08:02 train had reverted to one of the modern units (perhaps yesterday was a blip in diagramming), but, nonetheless, it was fairly quiet for the journey south to Bellinzona. Here we made the quick change to a loco hauled Lugano-bound service (propelled by SBB460, 460088), before taking a local unit the short distance to Capolago Riva S. Vitale. Even at 10:15am, the local Gelato stall outside the station was too tempting to pass up. Suitability refreshed, we took the short walk to the lakeside station. 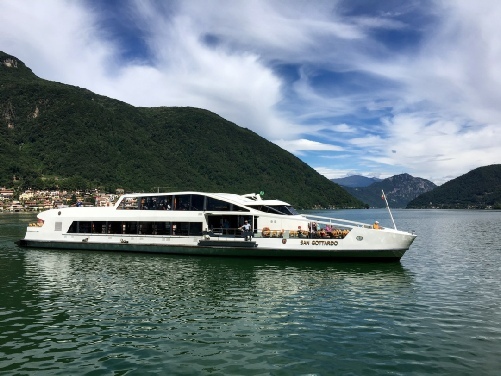 This 350metre extension is only served by one train per day - to connect with thesailing from Lugano, operated by the Lake Lugano Navigation Company. On our way, we passed by the depot buildings and decided to take a look around. The one member of staff we did find (the whole place seemed virtually deserted, yet all the doors were open) could not speak much English, although did not appear to have a problem with our group walking around for an impromptu depot visit. Some very interesting items of rolling stock were noted, including a snow-blower and ‘heritage steam train’ which sees occasional use on special days. A small display of the various types of rack-railways used throughout Switzerland was also found at the depot entrance. 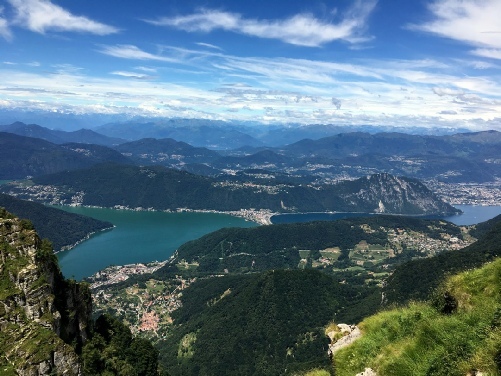 The Monte Generoso Railway service extends once a day to Capolago Lago station to connect with a cruise boat on Lake Lugano. 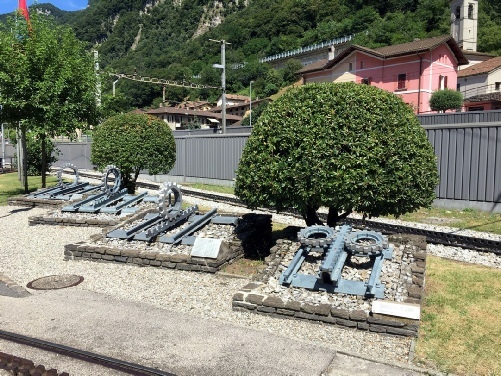 Members walked from the main station at Capolago Riva S. Vitale where we discovered a display of varying types of rack railway. We also found our way inside the local depot, where a snow-blower was kept. (Not needed as it was around 30’c outside). At just after 11:00am, the two-piece unit arrived into the lakeside station to await the arrival of the boat. I think the staff onboard were very surprised to see passengers waiting already - especially English speaking ones! The boat arrived a few minutes late, and two passengers (tourists) made the connection onto the train. Not an issue, as the traincrew were in communication with the boat to request ‘a hold’. Swiss efficiency at its very best. 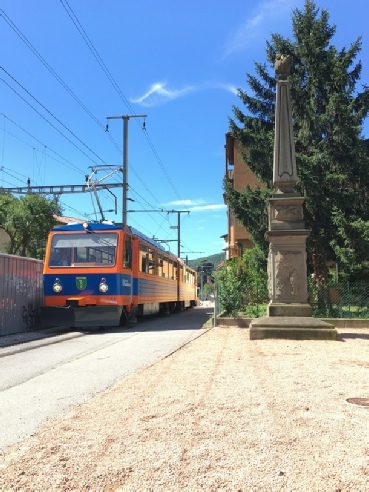 The train then set off back to the main station in Capolago, where it filled to capacity for the ascent to Generoso Vetta. 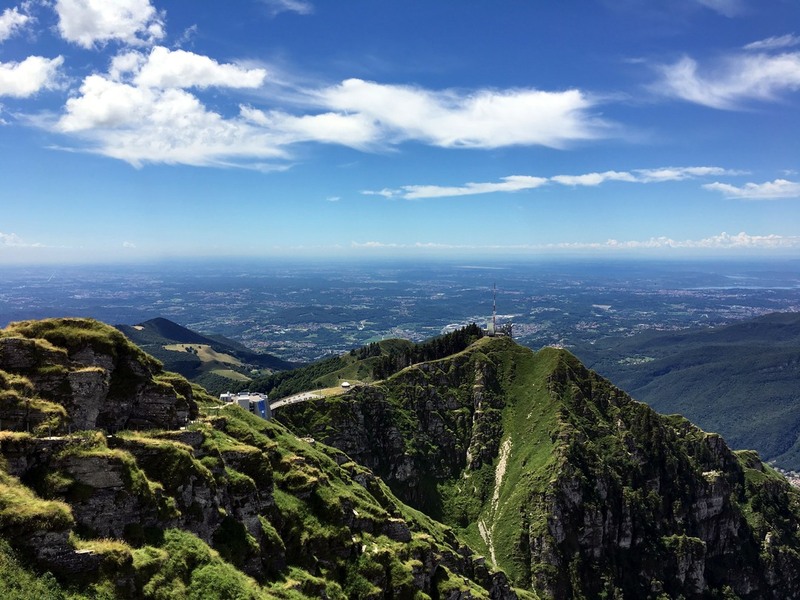 At 1,701metres above sea level, we reached the summit station with commanding views across the Swiss/Italian border regions. However, the railway station and observatory aren’t at the highest point, and so we climbed the remaining 150 metres, braving the 30’c heat in the process, to reach the lookout area. After our exertions, we retreated back to the summit station and took rest with a welcome drink and lunch. Suitably refreshed (again) we returned down to Capolago and made our way back to the lakeside station – this time on foot. 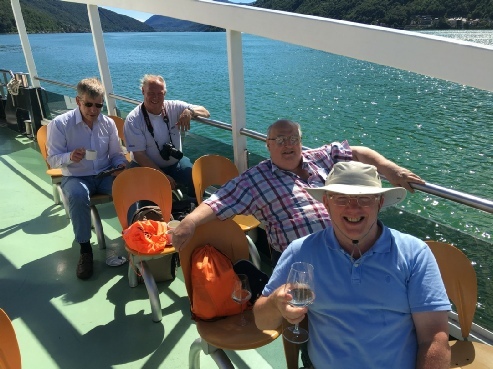 We had around thirty minutes to wait for our boat back to Lugano, and so the cool breeze coming across the lake was very welcome, although joining the fairly large group of locals using the dedicated swimming area would have been most welcome. Just before 16:00, the San Gottardo arrived and docked. We boarded and found seats on the open front deck. No sooner had we set sail, the waitress appeared taking orders for coffee, ice cream or prosecco! Again, I had hoped to conclude the day with an evening meal for the group at the harbourside, but the lack of trains back to Göschenen prevented it. So, instead we rode up the city funicular railway and boarded an early evening train home. Our hosts at the Chalet Krone provided another excellent meal to round off a very pleasant and fulfilling day. Saturday arrived, and I left the hotel before the rest of the group in order to sort the ticketing out for our day on the FurkaDampfBahn. The somewhat unusual process of reserving online, yet only paying in advance for part of the tickets (the return portion), left me wanting to make sure I had everything in place before members arrived an hour later. Swiss efficiency ensued, and within a few minutes of my arrival, I was in possession of everything I required, had met our host for the day, and was sat having a coffee in the station cafe. I even had time to watch an MGB car shuttle train unload and reload for its journey through the Furka Basis Tunnel (the 1982 route built to supersede the old route we would be travelling via today). With the group now all present, we were introduced to Miss Nellen (the daughter of our intended host, and today’s Station Master). 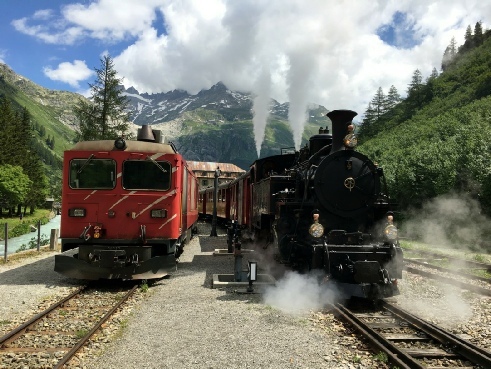 Through the arranging process for our educational visit, I had made contact with the FDB to seek permission for our group to ride in the cab of the locomotive. 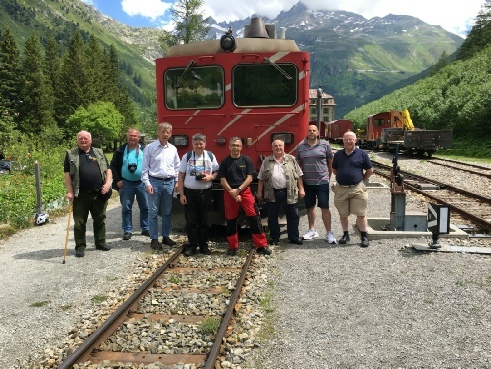 This had been approved, and so we were also introduced to the lokführer (locomotive engineer) Mr Bollinger, who welcomed members, two at a time, into his cab. Various features of the route and interesting facts were mentioned, whilst safely controlling the train through the stunning scenery. 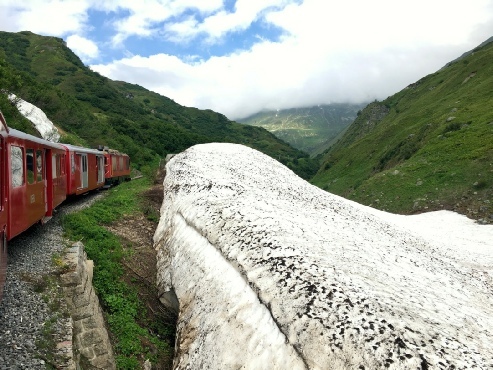 Even though it was early July, some huge deposits of snow and ice still remained along the route, clearly displaying why this former mainline route succumbed to the weather and was forced to close during the winter months. 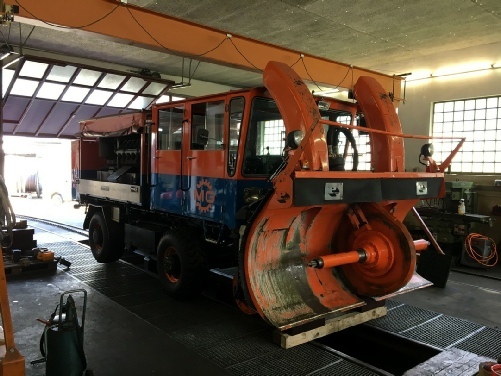 The retractable Steffenbach Bridge, near Tiefenbach, is still dismantled during the winter season to prevent damage by cascading snow in the area! Reopening of the line was expensive, time consuming and completed partly in sections. 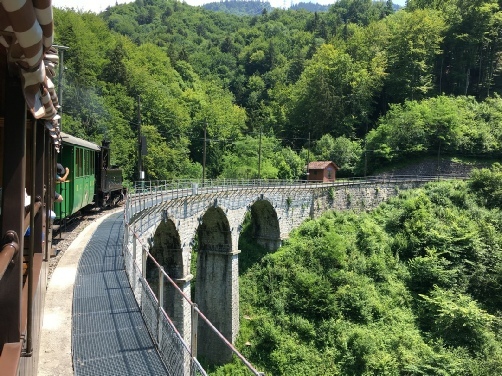 In addition to the above mentioned bridge, the line features a retractable section of rack-railway across a busy level crossing, and also an automatic fire-sprinkler system through the heavily wooded forest area between Gletsch and Oberwald. On arrival into Oberwald, an eastbound steam-hauled service was about to depart, and our diesel locomotive was used to propel the fire wagon behind it through the dense forest. After a short break for coffee, we returned back to Gletsch (riding in the open sided coach behind the locomotive), where the train pauses for just over 2hours. This is to allow time for lunch, for both passengers and traincrew. 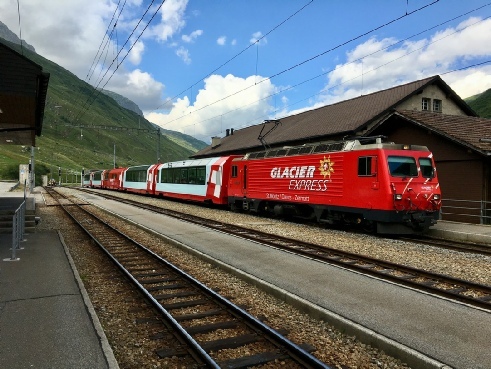 So, along with the driver, fireman and other staff, we opted to visit the Hotel Glacier du Rhône, situated across from the station. Sadly, we found out that beyond the impressive hotel, there isn’t actually much else on offer in this modern-day ‘staging post’. 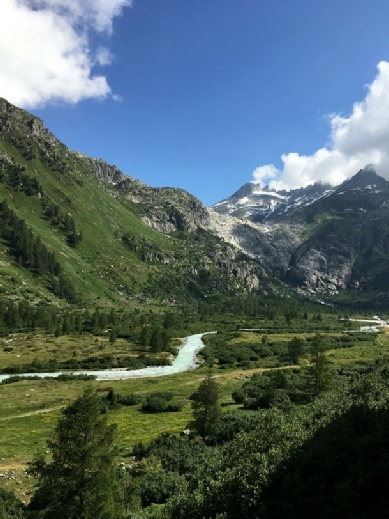 It would appear, that Gletsch offers little more than a resting place for bikers and coach parties travelling through the Furka and Grimsal Passes. Even the local museum had a sign on the door stating “closed for 2018 season”. A little after 14:00, we walked back to the station to await our steam-hauled service back over the pass. 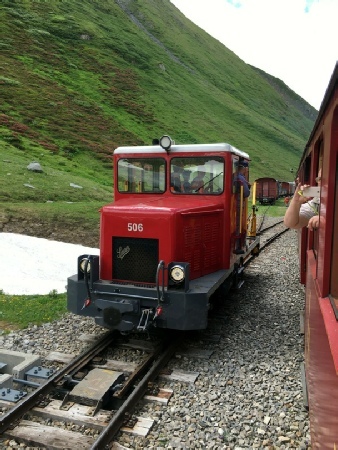 This was hauled by an original Furka-Oberwald Railway HG3/4 type, ‘no.4’. Our Chairman, Alan Spencer, chats to the driver, Mr Bollinger, during a station stop. The fire train, which ran behind the steam service - just in case! 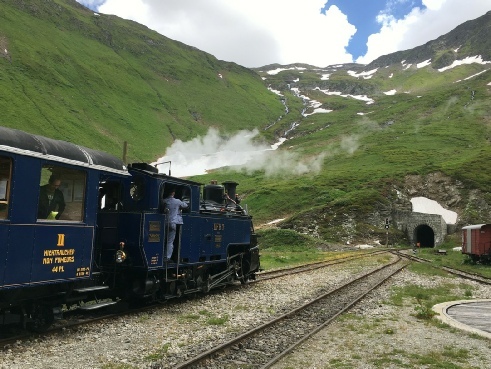 Once through the tunnel, the train pauses to take on water at Furka station, where passengers have around twenty minutes to alight and admire the views, before continuing to Realp. L&CI members pose with the locomotive we had travelled behind (and in the cab) prior to heading for lunch at the nearby hotel. It was explained that the railway only operates for around seventy running days each year (from late June to early September), during which, the steam locomotives clock-up around 4000-kilometers of use. Each summer, they also hire in a diesel locomotive from the MGB company, to operate additional services for hikers, and off-peak use too. 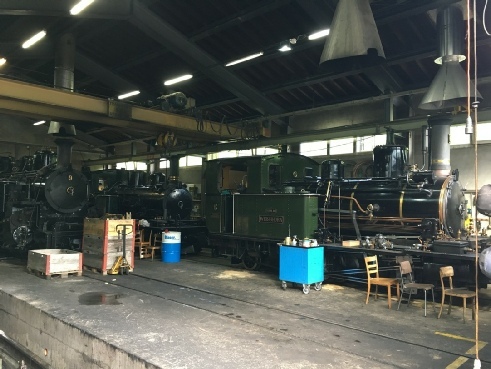 Currently they have five steam locos ‘in ticket’, with a further one having just arrived (having been repatriated from Vietnam and overhauled at Chur Works). Following acceptance trials, this will enter traffic in 2019, after which it is estimated that over 50,000 hours of labour will have been put in by volunteers to return her to working order, following its return to Switzerland. Volunteers not only maintain and repair the rolling stock, but also have the un-envious duties of major snow clearance work, uncovering and clearing tunnels (even those with protective entrance doors) and rebuilding of certain structures before each running season can commence. Considering the size of some of the ice and snow deposits still lining the track on the day of our visit in July, its not hard to imagine what the area must be like in the middle of winter – and hardly surprising an alternative mainline route was constructed in order to allow year-round running between Andermatt and Brig. All in all, this had been a fascinating day for all of us present. We had been treated exceptionally well (the paperwork described us as “official guests from British Rail”) by everyone we encountered, and they had gone out of their way to host us. 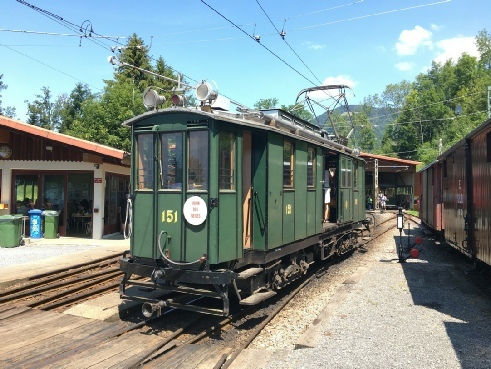 As a show of our appreciation, The Institution made a donation of 100CHF to their welfare fund, to go some way to ensuring the railway continues operating for many seasons ahead. For tonight, we were re-locating to Bellinzona, and so concluded our day in a new, yet equally as warm location. Once checked in, we opted to eat at our hotel restaurant, and over some locally produced wine, we chatted about our excellent day, and other things railway related. Our final day started with a trip through the 57km Gotthard-Basis Tunnel to Arth-Goldau. Our train was formed of a pair of Swiss/Italian ETR610 high-speed ‘tilting’ trainsets. Even on a quiet Sunday morning, the onboard restaurant was open for breakfast, so we made use of the facilities on the hour-long journey. Today we had originally intended to be heading for Schaffhausen, using a special train being operated by Verbano Express. However, in the weeks running up to our visit, this was unfortunately postponed by one week, so alternative plans had to be drawn up. After consulting with those who had booked, we opted to head to the impressive museum of the Chemin de fer touristique Blonay-Chamby. Now, Bellinzona to Blonay is by no means direct, and required no less than four changes of train! However, Swiss efficiency ensued again, and the plan worked like clockwork – almost down to the exact minute! Travelling via Arth-Goldau, then through the capital at Bern, we had an almost five hour journey to reach Blonay. The museum itself is located close to Chamby station on a separate branchline from their own private line which runs between Blonay and Chamby. The museum hosts around 70 different railway exhibits, and normally operates two or three along their private line. 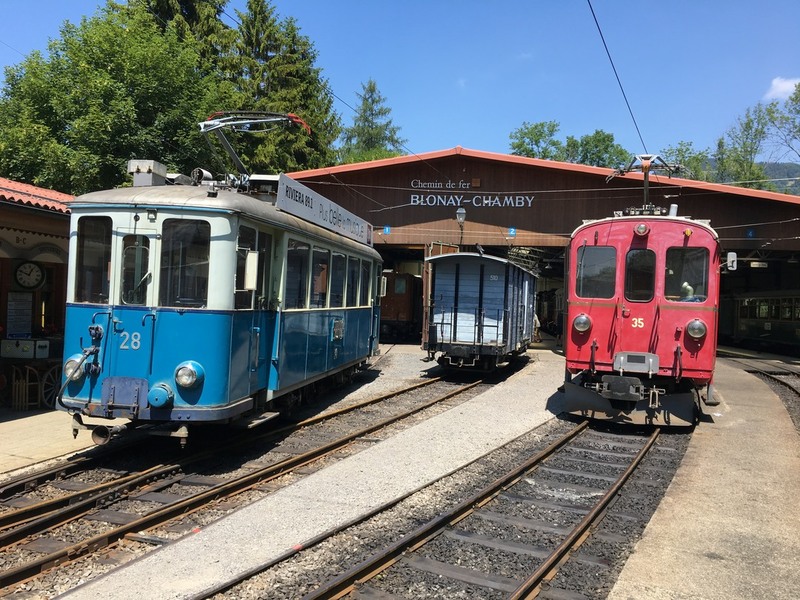 Today, saw use of an ex-Geneva works tram (no.151, dating from 1911), and a steam locomotive (G3/3 no.6, dating from 1901), which used to be owned and operated by the Bière-Apples-Morges Railway located on the opposite side of Lake Geneva. Once back at Realp, we met Mr Christian Meier, who was to show us around the depot. We took the short walk along the approach road, and chatted about our day so far. By the time we arrived, our steam locomotive had already got there, and was in the process of being ‘cleaned’, having made its final run for the day. Next to the turntable and steaming bays, we were stood beside a huge pile of recently delivered coal, and got proudly informed that it was Welsh coal, as it was far superior to their previous supply from Poland.